Agricultural Economic Insights Where Did Farmland Values Soar? Farmland values and cash rents have been a hot topic. For nearly a decade, the industry watched with excitement as farmland ratcheted higher. With farmland markets showing signs of softening, we thought it would be valuable to reflect on the Boom Era and take a geographic look at how farmland values and cash rents changed. Strong commodity prices and producer profits boosted cropland values higher in recent years. In figure 1, the change in state average cropland values from 2004 to 2014 are shown. A wide variation over the 11 year period is apparent. Strong increases occurred in the Northern Plains and Western Corn Belt while the Southeast and Southwest regions of the country frequently observed increases of less than 50%. North Dakota (318%), South Dakota (366%) and Nebraska (311%) reported the strongest increases in cropland values. In South Dakota, where values increased the most, the average value of cropland increased from $736 per acre in 2004 to $3,430 per acre in 2014. Another way of thinking about this is that over the 11 years cropland values increased at an average annual rate of nearly 17%. Such a large annual growth rates over such a long period is very impressive and pretty much unprecedented! How much cropland values increased also varied significantly within a region. Take the traditional Corn Belt states of Iowa, Illinois, and Indiana. Changes in cropland values for those state increased by 279%, 191%, and 158%, respectively. Figure 1. 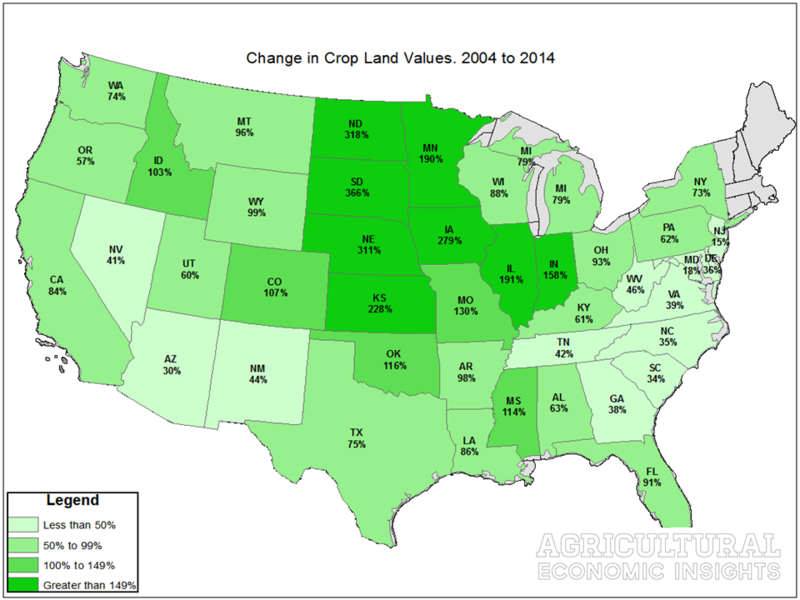 Changes in Average State Cropland Values, 2004 to 2014. Data Source: USDA NASS. Another component of farmland is cropland cash rental rates. Changes in the state average cash rental rate for non-irrigated cropland from 2009 to 2014 is shown in figure 2 (note the different time periods due to data availability). Like cropland values, cash rents also did not increase uniformly during this time period. Four states – Arkansas, California, Utah, and Washington – actually experienced decreases in the state average cash rental rates. Also similar to cropland values, the Northern Plains and Corn Belt regions reported the strongest increases. In Minnesota, for example, the state average cash rent increased by 64% in 5 years. Figure 2. 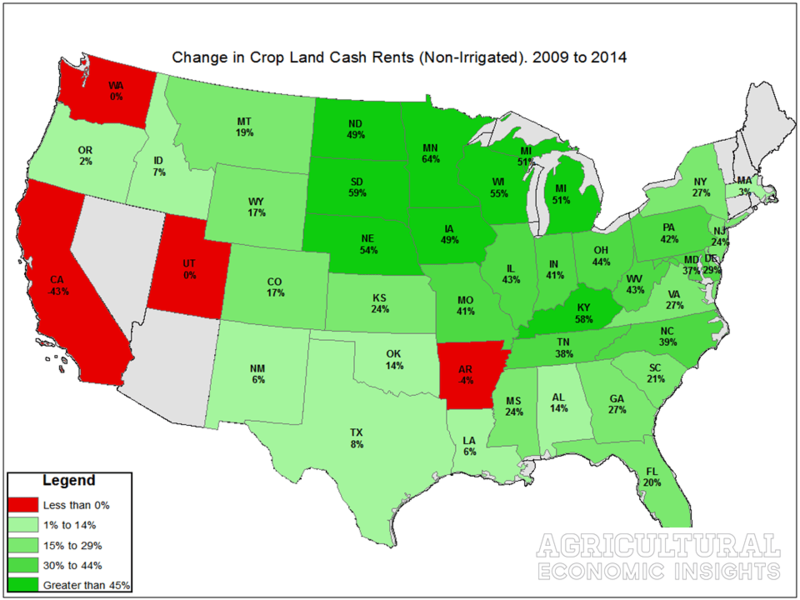 Changes in Average State Cash Rents for Cropland, 2009-2014. Data Source: USDA NASS. Just as changes in average cash rental rates varied by state (figure 2), variations also occurred within a state (Figure 3). Pockets of counties with large increases (illustrated in brown and yellow shading) are most prevalent in South Dakota, Minnesota, Eastern Nebraska, and Northern Iowa. In the Southern Plains and Southeastern U.S., small and negative changes in county cash rental rates (blue and red shading) were most common. The differences within a state can be quite significant. Take Nebraska as an example. At the state level (figure 2), the increases in non-irrigated cash rents was 54%. At the county level, however, increases varied from greater than 75% in the northeast corner of the state to less than 50% increases in much of the South. Figure 3. 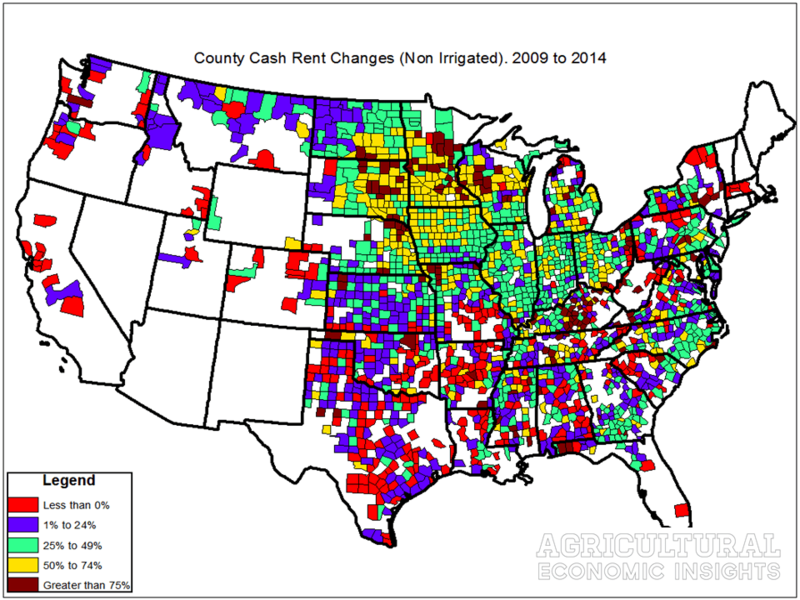 Changes in Average County Cash Rents for Cropland, 2009-2014. Data Source: USDA NASS. The run-up in values has not been limited to cropland. Increasing profits for cow/calf producers has also fueled an increase in average state pasture values, shown in figure 4. The Northern Plains experienced the largest increase in values from 2004 to 2014. Across the country, five states reported increases greater than 200%. Figure 4. 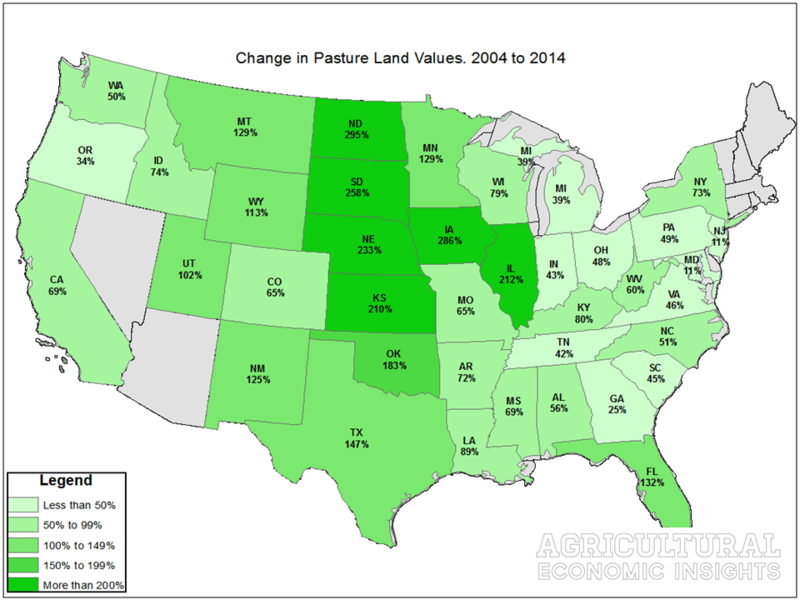 Changes in Average State Pasture Values, 2004 to 2014. Data Source: USDA NASS. After several years of strong farmland values and cash rents, it is important to pause and reflect on just how substantial the increases were. Farmland values (figure 1), cash rental rates (figure 2 and 3), and pasture values (figure 4) soared in the Northern Plains and Western Corn Belt states. The increase in these states – mainly Iowa, Nebraska, North Dakota, Minnesota, and South Dakota- were nothing short of phenomenal. On the other hand, the Southwest and Southeast regions of the country were insulated from the sharp increases. Most recently cropland values and cash rents have began adjusting to lower commodity prices and profitability. It’s important to note that just as the increases varied by region, state, and county, we expect downward pressure on farmland values and cash rents to also vary. It is important that producers, ag lenders, and ag retailers keep in mind the local and broader trends occurring in cropland and pasture in the coming years.